The earth does not burn at 5778 K like the sun, and therefore produces no shortwave radiation of its own. The earth radiates at about 288 K, a temperature that produces longwave radiation. When molecules absorb radiation according to their individual properties, higher energy shortwave radiation tends to produce “electronic” transitions where electrons jump to higher energy levels. Lower energy longwave radiation tends to produce rotational and vibrational transitions, where the atoms within the molecules move in relation to each other. Shortwave radiation is more likely to scatter than longwave. 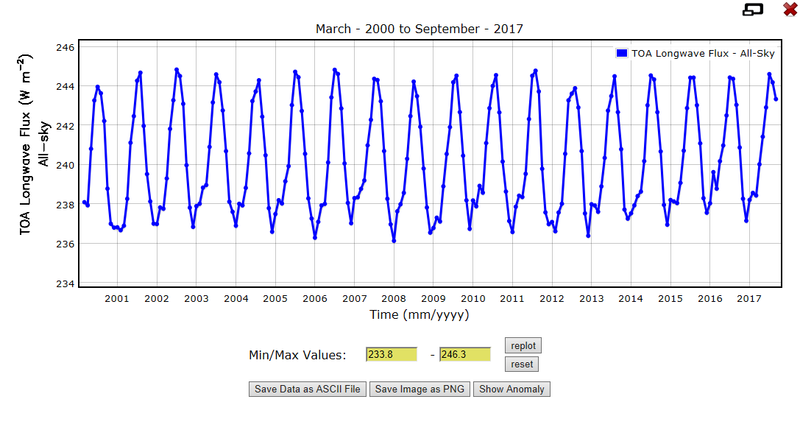 In the last post we showed that longwave radiation from the top of the atmosphere has increased over the period of the CERES data. The earth is believed to receive a steady 340 W/M2 in shortwave radiation from the sun. About 30% of this is reflected back to space from light colored surfaces. The possibility remains that if this reflectivity or albedo were to decrease, increasing the shortwave energy influx, the increase in longwave radiation might not cool the planet. 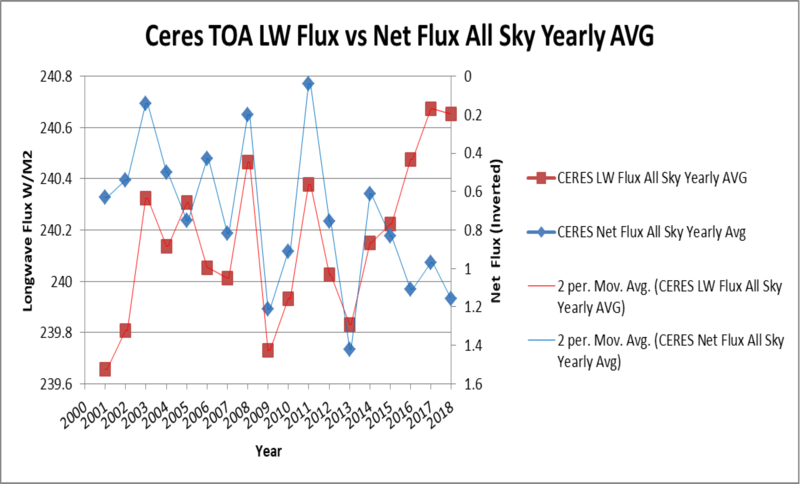 Fortunately, CERES gives us a net TOA flux that includes shortwave in, shortwave out, possibly some longwave in from cosmic microwave radiation, and longwave out. The net flux is defined as incoming minus outgoing, so positive values mean the planet is absorbing energy and negative values mean we are losing energy to space. This is opposite the LW flux, in which higher values mean greater energy loss to space. We see that net energy absorption, like LW loss to space, is higher in the northern hemisphere summer months, and that the planet loses energy in the southern hemisphere summer. The Min/Max values show a total range of some 27 W/M2. Photosynthesis consumes 5-10 W/M2 annually, depending on assumptions of conversion efficiency, and the far larger extent of photosynthesis in the northern hemisphere higher latitudes can explain part of this swing as increased SW absorption. When we compare LW flux with net flux above, we see that net flux is always positive, in spite of increasing LW flux’s efforts to cool the planet. There appears to be a signal in both LW and net fluxes to the moderate el Niños of 2003 and 2010; and a surprisingly strong (and delayed) response to the weak 2006 el Niño. The very strong 2016 el Nino shows a strong LW response, but no net response. Unfortunately, the record does not extend back to include the comparable “very strong” Ninos of 1983 and 1998. 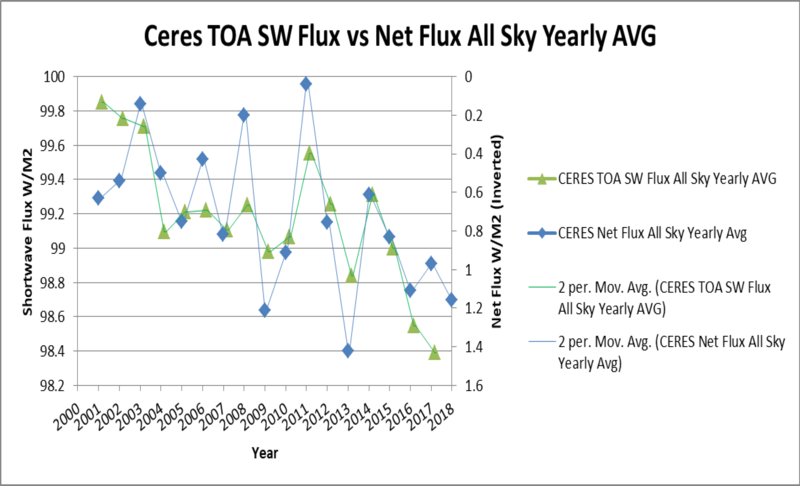 When SW flux is compared to net flux it becomes apparent that a very considerable decrease in SW loss to space (=increased absorption) has taken place in the CERES record. 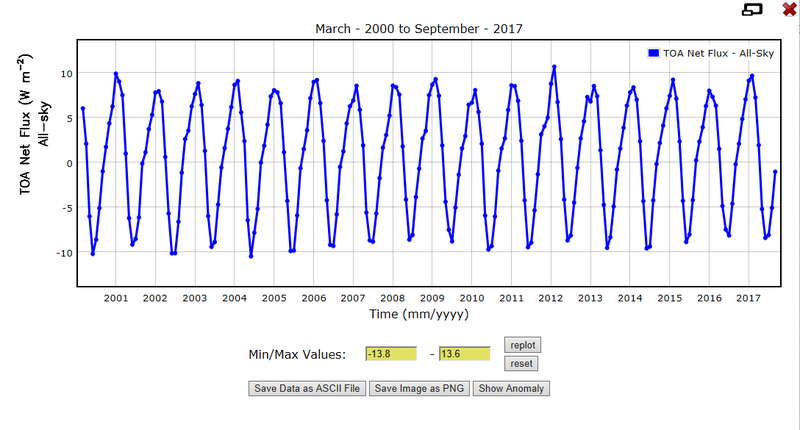 The increase in LW flux to space is on the order of 1 W/M2, and the decrease of SW flux to space is on the order of 1.5 W/M2 over the period of record. 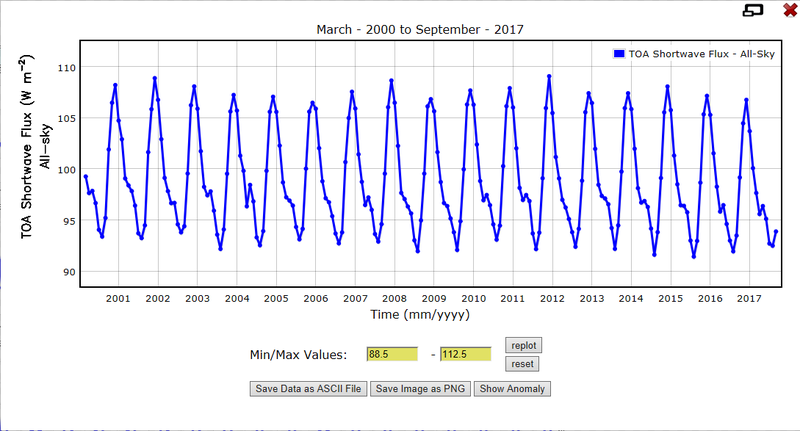 It must be noted again that January and February data for the year 2000 and October to December data for 2017 have been infilled according to the “nearest living relative” approach; 2001 and 2016 data respectively. The 2017 data will eventually be corrected, the 2000 data probably not. What we see above is that the SW flux added to the LW flux shows a decline generally in agreement with the increase in net absorption, as one would expect. There was some sort of aberration in 2005. 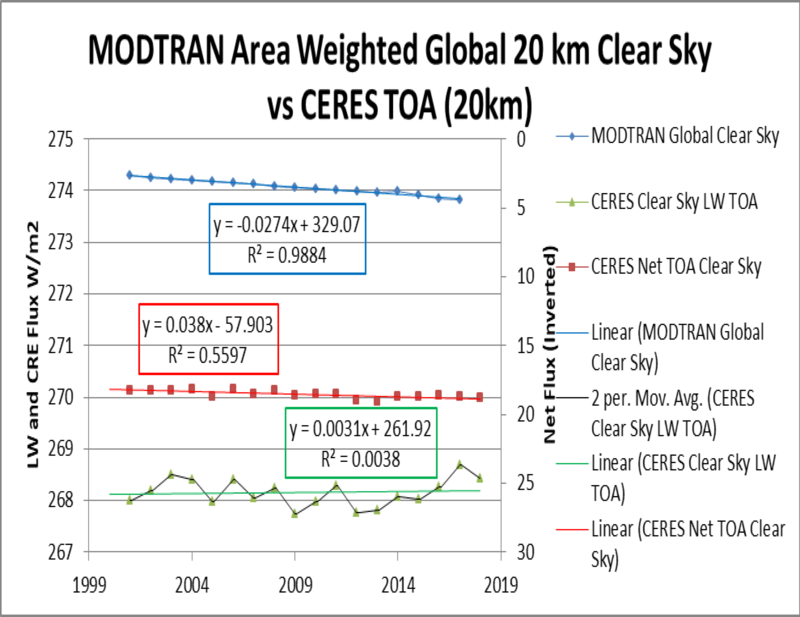 In the next post we will explore what can be discerned about where this increased SW absorption is going, before leaving SW radiation to focus on LW radiation and the disagreement between CERES and MODTRAN.